Many people would argue that Friday is the most frightening day of the week. Personally, it doesn't frighten me, as I once won an award for bravery and it just so happened to be a Friday and I was wearing a grizzly bear suit at the time to ward off anything that might leap out and try to scare me. But if I were you, reading this right now on a Friday, I would be extremely frightened. Because the subject of this week's story involves one of the scariest things I can think of, and that thing is geometry. Triangles are not, by nature, a terrifying thing. Take, for instance, Doritos. What could be less frightening than a light brown triangle wearing a coating of orange nacho cheese dust? So, when the Bermuda Triangle started swallowing ships, airplanes, and the occasional human being, people began reconsidering the terror factor of triangles. Especially in a town 700 miles from the Bermuda Triangle where this story begins. It was a town called Certain Doom, and for good reason too, as it sat on the very edge of a cliff overlooking a valley filled with extremely pointy rocks and man-eating lions. The people of Certain Doom were already very paranoid about gusts of wind, earthquakes, pointy rocks, and man-eating lions. So, when it was announced on the news that the Bermuda Triangle may have claimed another victim on a morning in October many, many years ago, the townspeople did not handle the news well. "AAAAAAAAAAA!" screamed a fifth grade girl in music class at Certain Doom Elementary. "What is it?" asked her music teacher in alarm. "A triangle! Over there with the percussion instruments." "AAAAA!" said the music teacher. "Class dismissed forever!" The school was evacuated and the S.W.A.T. team was called in. Two days later, the building was leveled, and too terrified to put anything new on the now-empty plot of land, the people of the town built a 75-foot-tall fence around the area. Lest the evil triangle return to have its revenge and/or swallow the town's vehicles and citizens. And that was only the beginning of how the town began cracking down on triangles of all sizes. The citizens of Certain Doom soon created a special task force whose job it was to eradicate all triangles in town. But because even the word "triangle" was terrifying to the poor people, they refused to even use it in the title of the task force. And so the Three-Sided Pointy Thing Task Force was formed. And their first stop, naturally, was the grocery store. "Quick, task force!" one of the task force members shouted. "We must get all of these bags of Doritos outside and smash them before the triangles get us!" The task force leapt to action, and soon they were all stomping on hundreds of Doritos and breaking them into non-triangular shapes that were terrible for dipping. "Oh, no! My shoes are covered with cheese-flavored triangle dust!" one of the task force members shouted, mid-stomp. "Andrews is tainted!" another task force member shrieked. "AAAAAAA!" Andrews said and then threw himself into Certain Doom Valley where he was impaled on a pointy rock. "AAAAAAAAA!" said another member of the task force who had watched him jump. "That reminded me that I'm scared of heights!" "AAAAAAAAAAA!" said a third task force member. "I just realized that the only kind of tortilla chips we can buy at the grocery store now are Tostitos Scoops." "AAAAAAAAAAAAA!" said yet another task force member. But he had nothing else to add. It is very important for me to mention at this point in the story that not everyone in town was afraid of triangles and found themselves rushing out to their closest toast point emporiums and stomping all of the merchandise into dust. Some of the people of Certain Doom were logical and intelligent human beings who had a healthy relationship with all shapes, including three-sided pointy things. One of these people was a local math teacher. And she thought everyone in town was overreacting. "You're overreacting," the local math teacher said. "No! I'm not!" replied the local pizza chef. He had just discovered that if you cut a circle-shaped pizza into equal-sized pieces, they turned into cheese-covered death triangles. "This pizza must be destroyed." "Fine, I'll take it home and destroy it," the math teacher said. She was extremely hungry and had no patience for nonsense, as she had just spent the day talking the principal out from under his desk after he discovered that when he cut his peanut butter and jelly sandwich into halves, it made two extremely gooey triangles. "I don't believe you," the pizza chef said. "Please, just give me my pizza," the math teacher said. "No! You'll destroy us all," the pizza chef replied, brandishing a pizza cutter. "If you don't, I'll do something you won't like at all," said the teacher. "What's that?" asked the very doubtful chef. In response, the math teacher took a geometry book out of her bag, opened it to the chapter entitled "TRIANGLES," and as the pizza chef fainted in terror, she took her pizza and left. The move was either incredibly brave of the teacher or incredibly foolhardy, depending on your stance on triangles and stealing pizzas. Now, you're probably wondering what my opinion is on triangles and the stealing of pizzas, as I am the author. Personally, I do not condone the stealing of pizzas. I once worked at Pizza Hut and was the victim of many a dine-and-dash for which I received no tips and an an extra trip to the salad bar of hurt feelings. As for triangles, if you aren't afraid of those, you will be in a second. Did someone say Pizza Hut? So, you see? Triangles are extremely dangerous, as the math teacher learned 10 minutes after she arrived home with her stolen pizza and choked to death. Luckily, for the the people of Certain Doom, the sacrifice of the interloper was enough to appease the triangle gods on that day and they were spared. 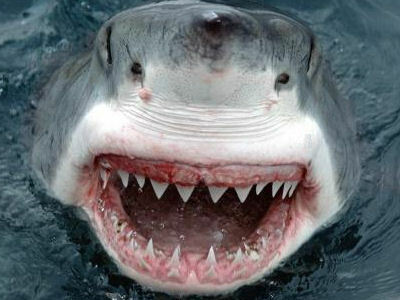 But if you find yourself traveling through the Bermuda Triangle on a dark and spooky night...beware of sharks. *I did not create the top image, but it is a work of brilliance.